Californian trio L.A. Witch are sharing their new single “Drive Your Car” ahead of their debut self-titled album release. The band are also set to tour the UK this September with shows in Bristol, Brighton, London, Glasgow & Liverpool. 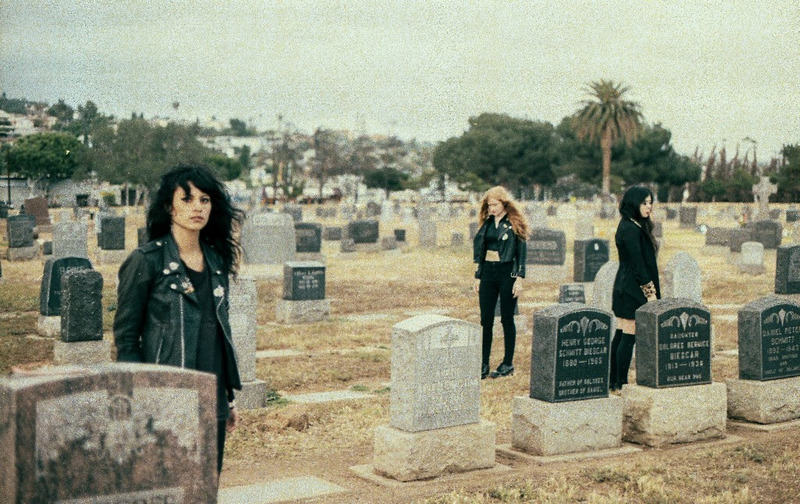 Though the band hails from Los Angeles, they do not partake in any sort of witchcraft. Yet their ability to conjure a specific time and place through their sound does suggest a kind of magic. On their eponymous debut album, L.A. Witch’s reverb-drenched guitar jangle and sultry vocals conjure the analog sound of a collector’s prized 45 from some short-lived footnote cult band. The melodies forgo the bubblegum pop for a druggy haze that straddles the line between seedy glory and ominous balladry; the production can’t afford Phil Spector’s wall-of-sound, but the instruments’ simple beauty provides an economic grace that renders studio trickery unnecessary; the lyrics seem more descendent of Johnny Cash’s first-person morality tales than the vacuous empty gestures of pre-fab pop bands. This isn’t music for the masses; it’s music for miscreants, burnouts, down-and-out dreamers, and obsessive historians. Suicide Squeeze Records is releasing their debut album on September 8th, 2017. L.A. Witch is available on CD, digital formats, and 1500 LPs on translucent pink vinyl with a download card.